It started out a beautiful Friday morning on the banks of the south fork American river. My girlfriend and I had camped the night before, and woke up on the sound of crashing river waves. 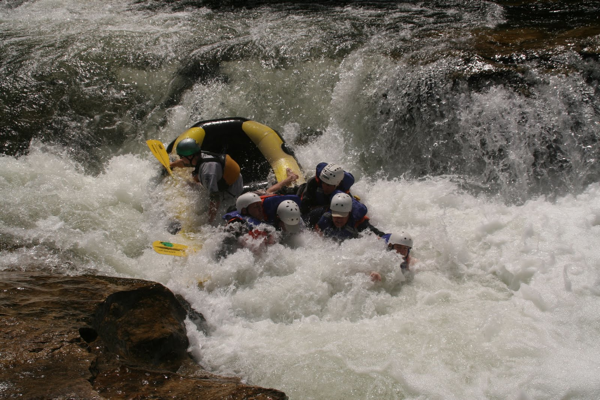 One of the perks of running your own business is that you can decide when to take your weekends, and we had decided that Thursday and Friday would be our weekend, and booked a white water rafting trip. But what I did not expect is that we’d end up on a raft with 60+ year old seniors who’d just made their big escape from of a retirement home in the East Bay to come and have an adventure on the river. “This is going to be booooooring!” I thought. Once we got into the water, I realized I was wrong: Apparently, when the remaining years of your life drop to a single digit, you start to take life less seriously, and more adventurously. After all, hitting the ground a couple of years sooner, and hitting it on your own terms, is more exciting than going quietly on a bed in a retirement home. “I wish I had relocated to a foreign country where I’d learn a new language and experienced different ways of living and thinking, instead of locking myself up into the same culture and perspective my entire life,” added Kent. In turn, each of them added to list of wishes and regrets, except the gentleman sitting quietly at the end of the raft. “Absolutely nothing,” said Ralph with a confident smile. I smiled and nodded in agreement. “What about you?,” asked Lindsey who was now more curious to get everyone’s answer. It was Ralph’s turn to smile and nod in agreement. Less than an hour later, Ralph’s body was being carried through the cold waves toward the rock wall, and a huge blue raft with 9 people onboard was on course to crash his head against it. Fortunately, the guide steered the raft away from the rocks in the last moment, turning it around so that two people could manage to pull Ralph into the raft. I realized that all regrets were things that people DID NOT do, rather than things they DID. They did not follow their dreams out of fear of failure or worry of judgements. And it’s only near the end of the journey that they realized they should have done all those things when they had the chance to, and before it was too late to do so. And the only person with no regrets was someone who did what he wanted over and over again. I didn’t ask Ralph if his companies succeeded or failed. It didn’t matter. What mattered is that he started them. And for that reason alone, he had no regrets. – How I launched a profitable product in 3 hours!